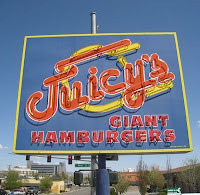 Juicy’s Giant Hamburgers in Reno, Nevada is a clean, new burger joint on Wells Avenue, a recently paved and face-lifted area that is in sharp contrast with much of the rest of Reno. 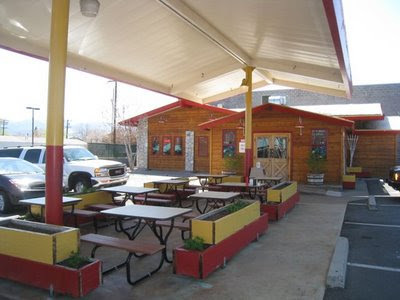 There are no slot machines; this place is about the burger. There are lots of places in the Bay Area named Giant Hamburger. They tend to be older burger places where you get a 1/4-pound burger that might have been considered giant back in the day, but now seems average at best. This is not one of those. The standard patty is 1/3 pound of fresh ground beef. 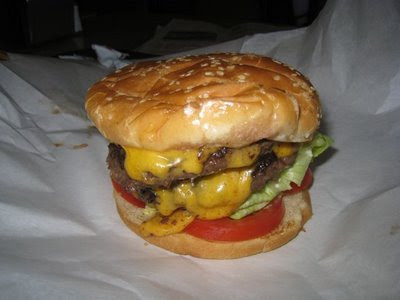 I got the Double Cheese burger ($6.57). I added fries ($1.47). There were no onion rings. The burger came out quickly, wrapped in white paper, with the fries in a plain white bag. Piled on top of ample lettuce, tomato and onion, the two patties covered in melted American cheese towered above the tray. I took a big bite and was very impressed that the burger was indeed juicy. Although presented like your classic burger with all the vegetables, mayo and mustard, this one had enough beef that the meat dominated the experience in all the right ways. The sesame bun was grilled nicely as well. The fries were thicker than most, with the skins on. They were very crisp and tasty. With its spare concrete floor, wood walls and basic laminate tables ad vinyl chairs, the restaurant was a clean, friendly port in the midst of all the casinos and cigarette smoke I had experienced the previous day or two. I recommend Juicy’s, especially if you are looking for a burger with your family. Another nice escape in Reno is to walk out the river trail west toward the mountains. There are rapids, geese, people walking their dogs and a couple nice parks. It is a great way to work off your burger. This one makes me hungry. Looks good Scott and great review. well, I have been a Juicy's love rfor over 20 years now BUT they recentlly changed the burgers and really screwed them up.. It's the little things that make a good classic american cheese burger and I believe that a big cold crisp pile of iceburg lettuce is a must! Juicky's is now using a thin soggy limp piece of some kind of yuppie leaf lettuce that just tastes awefull when it slides into your mouth. When I confronted the counterperson abouth this, they informed me that "everybody likes the new lettuce" which is total crap... one should never mess with a proven classic and the morons at Juicy's have amade a big mistake in my book... I still go ther, but with my own bag of cold crispy crunchy ICEBURG lettuce!